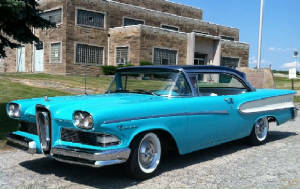 "They'll know you've arrived when you drive up in an Edsel." Welcome to my website! I'm glad that you found it and hope that you will enjoy it. Keep in mind that, like my Pacer, this website is always a work in progress. 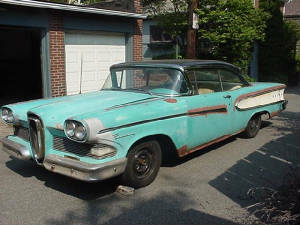 I plan to provide links to useful sites, a directory of addresses for and information about companies that supply parts and offer services, and helpful hints and tricks that I have found in my efforts to restore my 1958 Edsel Pacer. Moving day, from my garage to the bodyshop. A few changes to the website and how I will be updating my progress. You will see fewer updates here as the Pacer is moving to Facebook. 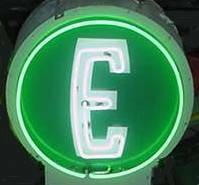 Please feel free to visit "Ed Hunter Pacer" on Facebook to follow my progress! I added a recent photo of the car in its almost finished state to the homepage. I will try to add some more photos in the upcoming days. July 2012. After 10 years of work!